Butler is a hugely popular selection of nifty utilities for the Palm Treo smartphone that manages to fix many of the minor shortcomings of the phone in one fell swoop. 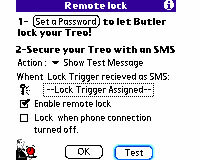 Billed as "The Essential Tool for the Treo 650 & 600", Butler offers a suite of tools to help you set up the Treo the way you like it and introduce productivity-boosting extras. 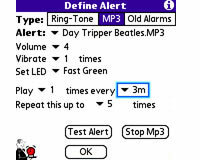 Accessed through a rather basic looking interface, Butler offers repeating alarms with ringtones/MP3 playback, nagging alerts, extra security options, navigation enhancements, LED controls, keyguards and more. We particularly liked the Keylauncher feature which lets you fire off specified programs from any other application just by holding down a specified key. Another option lets you specify different modes for the external volume buttons on the Treo; as 'back' and 'forward' controls for moving through recent opened applications used; a 'select key,' or as scroll bars (particularly useful for reading e-books). The Treo is one of those phones with a multicolour LED that is constantly broadcasting its status. Butler lets you take control over the colours and flash rates, and includes an option to set the hours the LED will do its flashing thang (handy if you don't fancy an all night disco show). 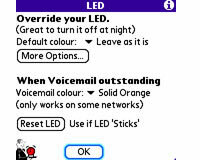 You can also set a specific colour to remind you of outstanding voicemails. An improved keyguard lets you override Palm's functions, offering control over the lock time (from 1-30 seconds) and the ability to disable the touchscreen, space, delete and return keys when incoming calls are received or in progress - so if you've got Spock-like pointy ears you won't be inadvertently ending calls. To absolutely, categorically guarantee that you'll know all about a missed appointment, incoming call, SMS, alert or voicemail notification, the "Attention Grabber" feature can nag you into submission, with options to keep on reminding you once every 10 seconds to every 15 minutes, from 5 to 1000 times. Reminders can be assigned MP3, vibrating alarms or ring tones, and custom LED notifications set up with an option to set time periods when the program shuts the feck up. 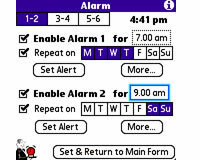 Butler also offers a straight alarm feature that lets you set up to 6 repeating alarms, complete with customised messages and the option to assign a program to open after you've cleared the alarm. The trouble with smart phones is that you by carting around all that personal information there could be serious consequences if it gets lost or stolen. To protect your data, Butlers offers a set of SMS-triggered security functions. By sending your missing phone a pre-configured text messages, Butler can carry out a variety of security operations from simply turning off and locking your device to the Armageddon option which wipes the SD card and RAM clean. Wrapping up the feature set is a "Hide SMS popup" option which stops you being bothered by SMS screens, an option to beam your business card by holding the phone button down and a useful "Keep Exchange Manager Clean" utility which addresses the annoying 'preference loss' bug seen on the Palm OS. 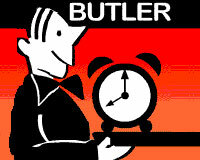 Butler is a fantastic set of utilities for fine-tuning your Treo, richly deserving its place in Palm's Best Seller list. The interface isn't the easiest to get your head immediately around, however, and sometimes things may seem a little confusing when first exploring the options. It's worth persevering though because it won't take long before you begin to wonder how you ever coped without Butler on your Treo - and at just $14.95 (�8.20,�11.90) it's something of a bargain!